I love fall and I love fall clothes. Unfortunately living in San Antonio, we don’t really have fall. Or a winter. Basically I’m saying it makes it hard to dress because it’s still kinda warm for sweaters and boots but I’m bored of shorts and sundresses! Anyway, here’s what I wore out for a shopping trip this past weekend. Still summery, but it was hot! 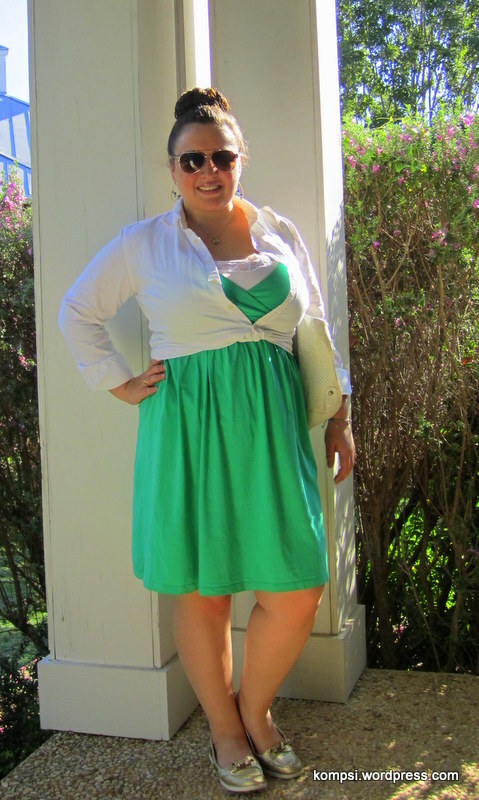 Button-down, Ralph Lauren; Sundress, similar (on sale for $16! ); camisole, Kohl’s; shoes, Old Navy; sunglasses, similar; handbag, similar. Lastly, who says you can’t wear white after Labor Day? Throw those antiquated rules out the window and wear what makes you feel great! My parents live in Arizona and I’m trying to help my mom transition from summer to “fall.” it’s nice to know I’m not the only one having trouble! Oh then you totally get it! But I bet Arizona has a dryer heat, it gets pretty humid down here in south central Texas. Anyway, I checked out your blog, very cute! My 15 yr old sister loves Asian culture and starting taking Japanese at her high school this year! Yeah, it’s dryer in AZ but we have that humidity in East Asia in the summertime, so I can totally empathize. I’m glad your sister is into Asian culture, it’s SUCH an enigma to me- one minute I get it and the next I’m completely wrong. Thanks for checking out my blog, I really like your style!